Just a few weeks ago, the blockbuster Batman v Superman: Dawn of Justice set a number of box office records during its opening weekend, grossing more in its first few days than any other March release in history (or any other Warner Bros. film, period). 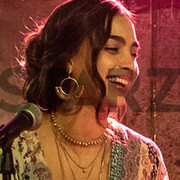 The following week, it made headlines in the industry press for more dubious reasons: the film's domestic receipts plummeted 69.1% in its second weekend. It turns out that Batman v. Superman just wasn't a very good movie; critics gave the film lackluster or even scathing reviews upon its release. So was the film's second-weekend failure predictable? Do bad movies perform worse at the box office than good movies? To answer those questions, we examined box office and film quality data for all major nationwide releases from the past decade, using our favorite proxy for film quality: Metascores. 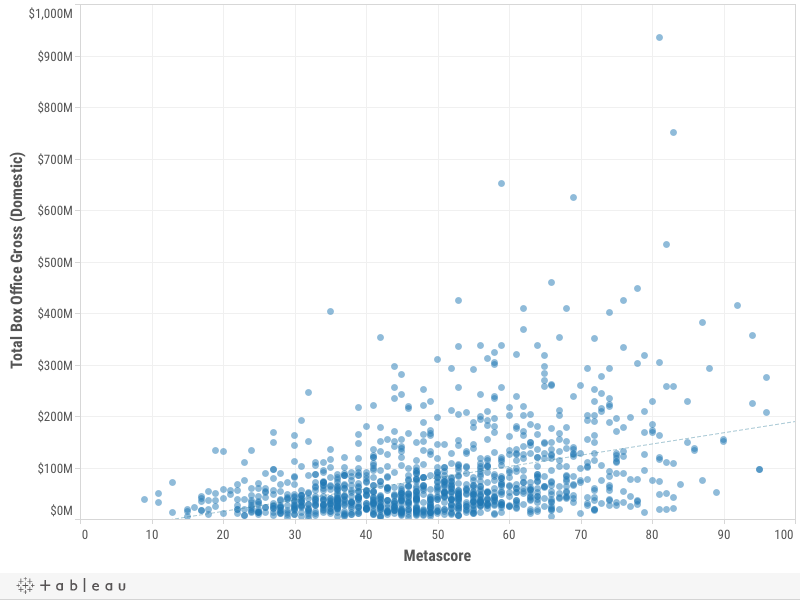 (For the uninitiated, Metascores represent the consensus opinion of top professional critics on a scale of 0 to 100, with higher scores indicating better reviews. 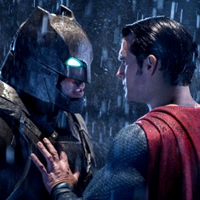 Batman v. Superman scored a meager 44.) And it turns out that, on average, good movies really do make more money than mediocre or awful films. While better movies tend to open bigger than lousy films, it is actually the period after the opening weekend when the link between film quality and box office performance becomes even clearer. You can view each film's details below (hover over any dot to see the film's name). Note that the size of each dot corresponds to the film's total domestic gross (for its full run), with larger dots indicating higher total grosses. Just for fun, we added Batman v. Superman into the chart so you can see how much of an aberration its second-week performance was (hint: you'll find it next to a bunch of Twilight films). Do Metascores correlate with a film's enduring popularity over the course of its entire theatrical run? Yes. 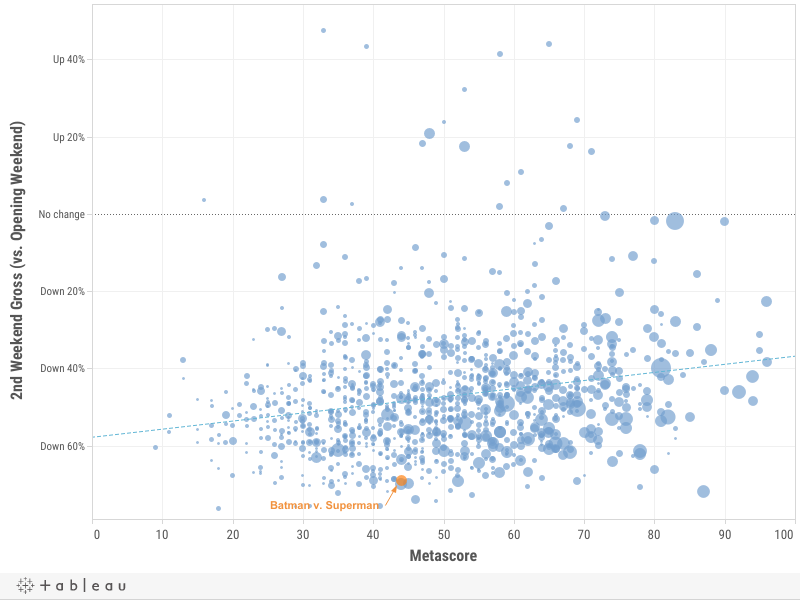 As you can see below, the higher the Metascore, the higher a film's multiplier, on average. In this case, we are defining "multiplier" as each film's total box office gross divided by its opening weekend gross. A film with a higher multiplier will thus have more "legs" and earn a larger chunk of its receipts after opening weekend. Oddly, the highest scoring films don't do quite as well as the second-highest group. This is likely an oddity caused by the tiny size of the 91-100 group: just seven films (four of which are Pixar releases). You can see that multiplier in action in our final chart, which compares the average total domestic box office grosses for each group of films. Because of the gradual rise in multiplier as the Metascore increases, the difference between each group's total grosses is more extreme than the difference between opening weekend grosses. In both measures, however, the simple rule holds: the better the film, the more money it collects, on average. That effect becomes even more pronounced once the Metascore reaches 81 or higher:. 14 44 Batman v Superman: Dawn of Justice (2016) $166.0M ▼ 69.1% ??? ??? * Among films opening at 3,000 theaters. Domestic grosses only. 1 44 Batman v Superman: Dawn of Justice (2016) $166.0M ▼ 69.1% ??? ??? With over 1000 movies that were released during a 10 year period, it seems that severe weather alone during some of their opening weekends would have cause more than 20 movies to do better on their second weekend. Your Squared R values (not corrected) are 0.04 in chart one and 0.15 in chart 2. Thus your hypothesis of predictability must be rejected. You can only talk about that a correlation exists, but not an actual predictability. Maybe a non-linear regression model might be useful, especially for chart 2 where there is a visual affinity to a quadratic behavior. If you've seen Freddy vs. Jason and gave that one a mixed or negative rating, then Batman v Superman deserves the same score as well. Like what I said earlier, Batman v Superman is a cash-grab and these so-called 'moviegoers' think it's not and they said the same thing to Freddy vs. Jason. There's no doubt you can't claim that Batman v Superman is better than Freddy vs. Jason or the other way around. While it isn't the worst DC movie (I'm looking at Batman & Robin), and really, hate.... on a mixed Metascore (Even they knew it was a cash-grab in the first place), I'm assuming that it should've been split into 4 movies because that's what Batman v Superman is. A confusing movie that never even worked in the first place. "The users have it about right on this one, 7-8." Lol, trusting so-called 'moviegoers'? That's great because along with them, you're going to regret giving it a positive score when Captain America: Civil War comes out and overtops it. Fantastic article, a great read and I can tell many hours went into writing this. To the editors of Metacritic, thank you for sharing articles like this! We actually enjoyed Batman v Superman much more than expected based on all the hate the critics gave it. I think if folks were comparing it against Batman 4 with George Clooney, they wouldn't be looking at it so harshly, but it's tough to go up against Chris Nolan. Also, if you look at the chart, both of the last two Harry Potters, and The Dark Knight Rises had 60-70% drops just like this movie, and those had very positive Metacritic ratings. The users have it about right on this one, 7-8. It's not a spectacular movie, but better than a 29%. Have you looked at some of the crap in the 20% range? Lots of herd behavior in the positive and negative camp on this one. It's a divisive movie in that regard, but it's better than the critics gave it. We'll probably see it again. Oh look, another one of those people that can't handle the Metascore. I'm the opposite. I can't handle that user score at all. It's too high. 7.3 and 69% user score on both here and Rotten Tomatoes. Captain America: Civil War will obviously be better than Batman v Superman: Dawn of Justice. I just know it and it proves Marvel can make great movies and handle them better than DC. Before you flame me, even 20th Century Fox (with the help of Marvel) made one terrible movie in 2015 and that was the new Fantastic Four which scored a 9% and a 27 on Rotten Tomatoes and Metacritic. I've completely lost faith in the users and FYI, you don't always have to listen to the critics. They judge by forming an opinion. You guys do the same as well. I feel like the only reason why Batman v Superman: Dawn of Justice exist is to purposely steal your money (because it's a cash-grab), yet you people don't even understand how it got a 29% and a 44 on Rotten Tomatoes and Metacritic. You're entering that moment when you did the worst mistake in your review career (which you gave it a 10). I dare you to watch it again and then come back and give me the total mistakes that film has made. 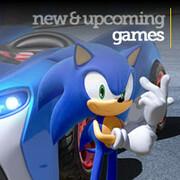 Too late metacritic. People know now what metacritic and rotten tomatoes really are. 84 early reviews for civil war, 44 and 29% BvS. Now... how is it possible that sensible, educated people that are not "nerds" enjoyed this movie? people that only knew Superman because of Man of Steel or Chris Reeves'? my mother, who looks by the way like Martha Kent, loved MOS and BVS both, and curiously she saw first the second movie (and hated it), then saw the Man of Steel, then she saw IMAX 3d BvS and had a blast. She is not a sheep, nor a fan, she's a pretty good critic too and can see differences between genres. If you want my faith you'll have to change. Ban all your "professional" mediocre critics, and start listening to the world. The fact that Batman v. Superman: Dawn of Justice got a positive user score totally disgusts me that these people never cared about its fatal mistakes and just went to see the movie without even caring and just going straight to all the fighting. It suddenly became the next Freddy vs. Jason. It totally deserved that Metascore, and that money at the box office too because it's biggest promise for existence is cash-grabbing. I don't get how that's usually a great movie. Before you flame me, I did not gave it a negative score. Check the reviews for my name on it. This, though, is also great comeback for a lot of movies (and also the worst movie I've ever reviewed). Incredible data! Thank you so much for your effort.